The Sublimation Thermal transfer ink made in our company owns good fluency, high rate of metastasis and bright color stability. Ink water passed SGS testing and reached the international quality certification .The quality is good and printing precision is high, vivid color, fine design, rich color, and strong color fastness. (1)Using high quality imported raw materials, can be directly applied in the chemical fiber, silk, nylon and other fabrics and ceramics, metal plates and other items. (5)Professional color correction processing, color screen is brighter, and restore good. (6)Certified by SGS, it is no harmful to the environment and human body. Applicable models: All of 7 color printer ;the Epson4-Roland inkjet printers; Mimaki inkjet printers; Muton inkjet printers; piezoelectric inkjet printers; digital printing; inkjet printing machine and so on. The applications include: garment printing, cloth printing and dyeing, light industry products (shoes, hats, boxes, bags, umbrellas, ties) printing, garment accessories, ribbon, printing and other areas of expertise. Advertising ,display, photography, craft gifts, window cloth, ceramics, metal printing and other industries. 1 Under normal circumstances, can be transferred directly to the printer cartridge to print. 2 Open a bottle Shake well before use. 3 Production need to be printed graphics into an anti-image print to paper by heat transfer machine transfer is Figure. Sublimation Thermal transfer ink Printed list of the desired temperature (for reference)----- Aluminum plate, stainless steel, copper and porcelain coated, the thermal transfer the desired temperature can refer to the temperature of the polyester fabric. 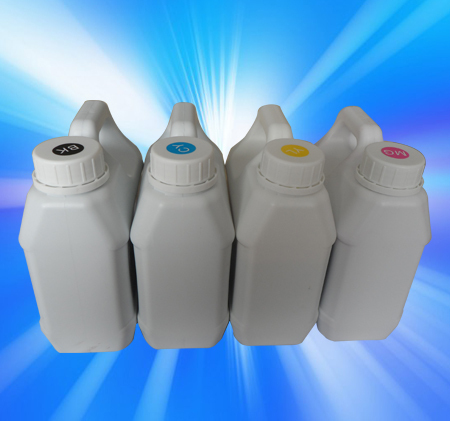 Packing Specification: 100ml, 200ml, 500ml, 1000ml plastic bottle.